Red tape marks the trap door through which an inmate falls as he or she is hanged. Japan, one of the few industrialized countries with the death penalty, showed one of its execution chambers to the media for the first time Friday. Reporters were shown the death chamber at the Tokyo Detention Facility, one of seven used across the country, according to a report in the Mainichi Daily News. Pressing a button in another room releases the trap door. The unprecedented media access was ordered by Justice Minister Keiko Chiba, who after witnessing the deaths of two condemned prisoners last month, said she wanted to have a national debate on capital punishment in Japan, Mainchi reported. Chiba has previously spoken against the death penalty. Execution in Japan is carried out by hanging. The chamber showed to the media on Friday had no noose suspended from the ceiling but showed a trap door outlined in red. The condemned fall to a room below the execution chamber where their deaths are confirmed. Reporters were not shown that room out of "consideration for the inmates' family and wardens," according to the Mainichi report. A room where inmates are told they are about to be executed and can meet with a chaplain. They did see other areas involved in the execution process, including the room where a button is pushed to release the trap door, a room where the condemned can get religious last rites or an entry room where inmates are told they are about to be executed. 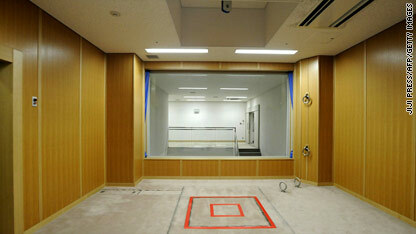 In an accompanying article in Mainichi, prison officials described Japan’s execution process, long shrouded in secrecy. The two men executed on July 28, Ogata Hidenori, 33, and Shinozawa Kazuo, 59, were the first put to death since the August 2009 elections in Japan, according to Amnesty International. The organization says 107 prisoners remain on death row in Japan. Is it me or does it seem that society in general has become WAY to soft on criminals? Have you ever visited a prison? I have and am appalled at the freedom these criminals receive. The system needs to be simplified. You do crime, you consciously given up your rights as a citizen. That means you can't vote, you can't appeal, you can't make $$ in the system as you serve time and it gets deposited in a Savings Account that is owned by the criminal (you've read right, lesser criminals who have "talents" can sell their goods from within the system!!! ), and the list goes on!!!! An eye for an eye is very simple. Heck, I would go so far as to say, they die the way they killed the victim(s)!!! You hacked them to death, you get to be hacked to death!!! But, no, that is too barbaric..it is more "humane" to lock these animals up in a cage, as they sit in their cell and rot, while our tax $$ are feeding/sheltering them, instead of being used to give homeless individuals a chance to become prosperous citizens..yeah..that makes ABSOLUTE sense!!! Now, I do not know what the % of error is on convicting the innocent, but if it is indeed 2% as stated earlier by someone, then I'm comforted in knowing that 98% of them will get their justice. HOWEVER, the system needs to be vastly improved to be more proficient in processing them. To start off easy, they can start by creating an Express Lane to Death Row when they either willingly confess to the crime or get caught "red-handed." During that time, there are no appeals given and it is just a matter of time before their number is up. PERIOD. If you want to be humane about it, I guess you can give them a nice option list on how they want to die: hang, shot, electrocuted, sleep, etc. If you think keeping them in prison is working, look at how much BIGGER the prison population has grown. I believe the U.S. has the LARGEST prison population!!!! Is there something wrong with this picture??? And you should be the one who is hacking them to death.I feel sorry for you. About 30% of those on death row got exonerated by DNA evidence when it became available. Most killers are convicted without DNA evidence. That means that as much as a third, but probably 20% to 30% are innocent of the crime they get convicted of. Hey right-winged, rednecked, pseudo-religious Republicans at CNN, your blatant bias is clearly the reason that you have not posted my comment. Post this one; I dare you! I don't get why they do this. if they murder some one, they are ought to be killed, but what will happen once they are killed? will they'er relatives want revenge? death is better than paying for prision but then, why would be told that they would be killed the minute before they are gonna be killed? because they can't do anything about it? * See Appendix for list of exceptions. In this day and time with DNA and all the tools they use to be positively sure that person is condemned to death because they committed some horrible crime or murder, then I believe they should be put on death row. If they are on death row and there is positive proof they committed this crime, they should be put to death. Our judicial system here in the US is outrageous. They protect the criminals and victims remain the rest of their life in fear. I believe in an "eye for an eye". If someone murders someone else and there is no question they did it, they should go to the death box immediately, not sit on death row for 20 years. There is too much crime and murder in the United States because our judicial system is so laxed. Half these criminals are happy to have free room and board, food, everything they need. I say put them to death the day they are sentenced. Yes, I agree, years ago innocent people were condemned but with today's DNA and all they have to work with and 20 people saw the person commit the crime, yes, they should be put to death immediately. Throw in abortion, embryotic stem cell research, politics and religion and we'll have ourselves a real party! To all you that's against death penalty, it's nice to sound conciencious and rightful until you became a victim and you'll change your tone. Liberal is liberal until something happen to them. The death penalty is an absolute must. It astounds me that we live in a country where the Liberals have created such an environment of sympathy for the criminals, while just totally ignoring the need for justice and rights for the victims. It's like those who invented the term 'Suicide Bomber' when what these criminals are doing is clearly committing murder. Liberals want to give murderers and their excuses for killing – validity and sympathy. Furthermore you only have to look at a beast like Charles Manson who should have been executed for his crimes but escaped the death penalty simply because of timing, to know how flawed the argument about life imprisonment is. Not only does good ole Charlie enjoy three square meals, health care, and entertainment, he also has the freedom to adjust his perspective for his surroundings and most likely live a fairly comfortable existence in jail. To think there are hard working Americans, that never committed a crime but live without food, shelter, or medical care while demons like Manson have all that provided to him. Sharon Tate was slaughtered like a pig but the Liberals want to give Charles Manson a better life than millions of hard working – honest Americans. Since D.N.A, has become an indisputable science,more than twenty inmates on death row has been released as being wrongly convicted. Until there is a fool proof way of committing guilty people to death,the death penalty should be abolished,as it has in every other western nation, Just one innocent person being put to death,is unacceptable. OH! Hanging. Cheap, easy, technology is sound, very few mistakes made throughout the centuries, guaranteed effective. I like it. This lethal injection crap... costly, obsurd, questionable. Hang – snap. Yes, it is SO MUCH BETTER to take convicted murderers of multiple innocent victims, found guilty by a jury of their peers to overwhelming evidence...and incarcerate them for life at the cost of $70,000 per year...OR...better yet...to only put them up for 5-7 years, for nearly $500,000; then let them out so they can kill again...then, you spent the average $750,000 on the 2nd trial, then again $70,000 per year to incarcerate them. All, for a person who won't earn $500,000 in their life...and will on average, kill 3.7 people before finally incarcerated for life without chance of parole...to serve 25-35 years, or to consume $1.5-$2.0 million dollars of taxpayer funds...because they are sociopathic. This makes NO SENSE. You could feed whole nations of starving people for the worries given to these evil individuals!